Once upon a time there is a land named Ilance, ruled by wise and brave queen, the living symbol of the realm. There are two factions: the aristocrats and the knights, in which have for generations vied for power through a test of strength and skill known as the Adjuvant Trial. Tonight two best student from each faction will do battle and the winner will decides which faction will hold military, political authority and protect the queen. Croixleur is a fast paced third person action game developed and published by doujin circle Souvenir Circ. which was released at Comiket 78, on August 15, 2010. The game considered by many as Bloody Palace spin-off from Devil May Cry series, but with minor variety. 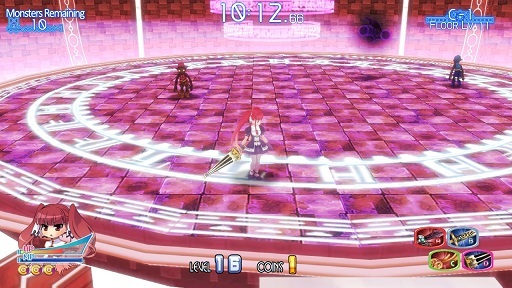 In January 2013 it was localized in English by Nyu Media with same game modes but with optimized widescreen and HD display modes. As the game gained popularity overseas, the developer continue the story in CroixleurΣ which was released at Comiket 85, at the end of 2013. The player character is Lucrezia Visconti, a mischievous redhead known as the Vermillion Vortex who embark on the Adjuvant Trial. She must ascend the Tower of Neit, a magical construct that houses a horde of wicked creatures. As if defeating hundreds of monsters wasn’t enough, Luc’s competition in the race to the top turns out to be her childhood friend Francesca Storaro, the Moonlight Sword Princess. The first student to complete the test will go on to become a Sword Sorceress. While the plot is pretty straightforward and probably not appeal overmuch, Croixleur still offers a fine action driven game. There are three game modes, but basically have same basic underlying goal: destroy all enemies and open point a portal to the next stage. In story mode player fight to complete the Adjuvant Trial and unlocking new in-game achievements or weapons. Score attack is a three minute skirmish where the goal is to score as many points as possible within the time limit. Endless mode is a survival where player must survive for as long as possible. 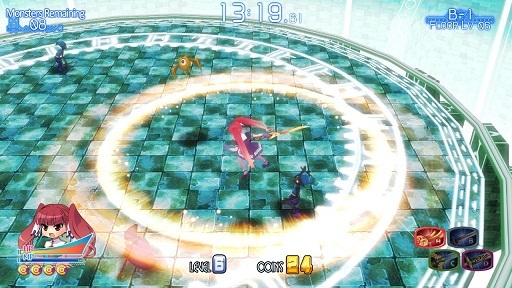 As an arcade arcade-style game Croixleur featuring various attack and combo options. At first, hitting the attack button three times will allow Lucrezia to make a three-swing combo. New weapons with a unique special ability will be unlocked as player completes milestones within the game. These weapons can be used at the start of the next play-through. Lucrezia also has dash ability which allow her to step out of the way of an attack quickly, or to charge quickly towards her next target. Using combination of jump, dash and attack is very useful to clear levels as soon as possible. There is very little variety in the types of enemies: goblins, magic goblins, flying eyeball creatures, and two types of mini boss. The difference are only in hue and the number of hits it takes to dispatch them. Similar in stage and scenery, the only thing to differentiate the rooms is the appearance order of the mobs. Though Croixleur isn’t breaking any especially new ground, with twenty achievements will be enough to bring a player back for more.